Distributed combined heat and power has been recognized as a cost effective way to produce energy required in every-day life, allowing to minimize transmission losses and waste heat resulting from the otherwise separate production of heat and electricity in central power stations and heating units. 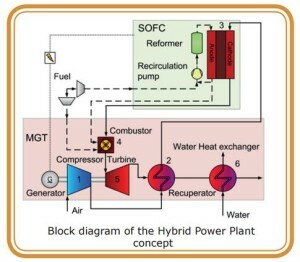 Hybrid power plants, resulting from the combination of a micro gas turbine (MGT) and solid oxide fuel cells (SOFC), are considered as the most promising technology for improving efficiency in future power generation. In fact, hybrids are able to convert fuel more efficiently, reaching high levels of electrical efficiency, generally above 50% even for 100 kW size and up to 60% for 1 MW size, making them suitable for distributed generation applications. Bio-HyPP is a research and innovation project funded under the Horizon 2020 EU programme, investigating and developing a full scale technology demonstrator of a hybrid power plant system with an electric power output of approximately 30 kW in lab environment. The uniqueness of the Bio-HyPP system will be its ability to run with biogas, natural gas or a mixture of both as fuel intake.This capability will allow its installation at locations of biogas production, providing an efficient way to produce energy from biogas. Moreover, its flexibility will permit to address users’ energy demands and to produce electricity and heat efficiently, reducing losses, waste heat and emissions at affordable costs. The technology can be described as follows. The air is pressurized by the MGT compressor (1), directed into the recuperator (2) where it is preheated by the MGT exhaust gas, to be used for thermal management and air supply of the SOFC (3). The gaseous fuel is conditioned and oxidised in the SOFC producing electrical power. The remaining fuel downstream of the SOFC is burned in the combustion chamber (4). The burned gas expands in the turbine (5), producing additional electricity through the generator while the remaining heat can be used for heating purposes (6). Sustainable Internal rate of return: >15% over 20 years. The development of the full-scale demonstrator of the Bio-HyPP technology, suitable for biogas exploitation, will validate the outstanding potential of the hybrid plant concept as an efficient and energy-sustainable source of heat and electrical power. To get an up-to-date insight into real market conditions from business related companies, the Bio-HyPP project also intends to act as a platform to engage and connect other technology, market experts and potential final users, with the aim to share knowledge and to prepare user acceptance of the system under development. For this reason, a Stakeholders Group has been established, involving research organisations and industrial companies, as well as experts from the energy market. As a first step, preliminary views on European energy market and system suitability have been collectedand results were shared through the Bio-HyPP website. As a second step, an in-depth questionnaire will be released by March 2018 to collect valuable inputs and expectations on the future marketability of the system. A third step will involve a round table discussion including a presentation of results and a lab tour showing the test rigs and the demonstration plant to the Stakeholders Group members, in spring 2019. With these measures, the project will define short-term and long-terms power- and heat needs of end users in a sustainable environment that would become the objective of further development. If you are interested to join our Stakeholders Group, please register here. The Bio-HyPP project started in June 2015 and will end in May 2019. The project has received funding from the European Union’s Horizon 2020 research and innovation programme under grant agreement No 641073.